TAMPA, FLORIDA- In a bid to turn around the company, Yahoo! CEO Scott Thompson has announced it will lay off 2,000 workers, or about 14 percent of its workforce. What this means for search engine optimization remains to be seen. 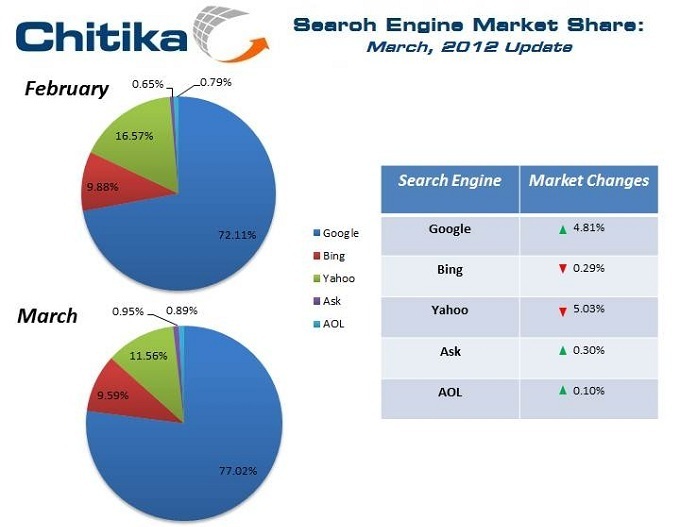 According to Search Engine Journal, the latest market shares (March 2012) for the top three- Google, Yahoo! and Bing- total more than 98 percent of the total search engine market, with Google far outpacing the other two with 77.02 percent. Yahoo! remains in second place with 11.56 percent compared to Bing’s 9.59 percent. This is the fourth time in six years that Yahoo, Inc. has conducted mass layoffs. Thompson says the move will save the ailing company about $375 million dollars per year. The layoffs are the largest in the company’s 17-year history. The changes also include a reshaping of the board of directors. Thompson is Yahoo’s fourth full-time CEO in less than five years, a period marked by steady declines in revenue. A leader of the search engine pack once upon a time, Yahoo! has been overtaken by Google and Facebook in the race for online advertising. Yahoo!’s website remains a popular destination, tracking about 700 million visitors per month, but people have spent less time there and more on Google and Facebook. On a related Facebook note, Thompson recently launched a series of lawsuits against Facebook. Facebook is firing back with its own counter-suits. Yahoo! claims that Facebook is infringing upon several patents owned by Yahoo!, including patents on methods for advertising online. Facebook’s counter says Yahoo! has violated its patents covering advertising, online recommendations and photo-tagging. Yahoo! has dismissed the new lawsuit, saying it’s without merit. Yahoo!’s future is uncertain but for now, the company remains a player in Web search, albeit a far distant second to Google. Sure, yahoo!\’s future is uncertain but this a price they have to pay for their neglect to social media,when they turned off their service for yahoo!360 many of their users chose Facebook. Yahoo was the only search engine that I knew when I started working on Internet, but today it’s got a long way to get to the top along with Google. Maybe it’s not Yahoo’s fault to fall behind in the search engine competition. Thank you for information! Very good content! Yahoo was the only search engine that I knew when I started working on Internet, but today it\’s got a long way to get to the top along with Google. Maybe it\’s not Yahoo\’s fault to fall behind in the search engine competition. What is suppose to be core business of Yahoo! should we need to optimize our site for bing and google separately?